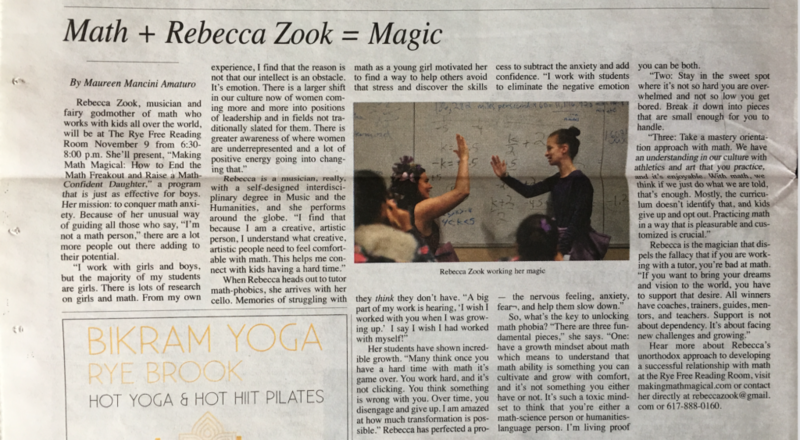 Rebecca Zook - Making Math Magical and Master-able for Kids on a Mission - Math Tutoring Online - More than Just a Math Tutor » Making Math Magical is in the newspaper! Making Math Magical is in the newspaper! I’m so excited…. I was interviewed about the process of making math magical for an article for the Rye Record newspaper by the fabulous Maureen Mancini Amaturo! Rebecca Zook, musician and fairy godmother of math who works with kids all over the world, will be at The Rye Free Reading Room November 9, 2017 from 6:30-8:00 p.m. She’ll present, “Making Math Magical: How to End the Math Freakout and Raise a Math-Confident Daughter,” a program that is just as effective for boys. Her mission: to conquer math anxiety. Because of her unusual way of guiding all those who say, “I’m not a math person,” there are a lot more people out there adding to their potential. So, what’s the key to unlocking math phobia? “There are three fundamental pieces,” she says. “One: have a growth mindset about math which means to understand that math ability is something you can cultivate and grow with comfort, and it’s not something you either have or not. It’s such a toxic mindset to think that you’re either a math-science person or humanities-language person. I’m living proof you can be both. “Two: Stay in the sweet spot where it’s not so hard you are overwhelmed and not so low you get bored. Break it down into pieces that are small enough for you to handle. Hear more about Rebecca’s unorthodox approach to developing a successful relationship with math at the Rye Free Reading Room, visit makingmathmagical.com or contact her directly at rebeccazook@gmail.com or 617-888-0160. Is your creative kid freaking out about math? Do you want them to truly master math and love it so their dreams can come true without experiencing math as an obstacle? I’d love to connect and explore if my work would be a fit for your child! You have nailed it Rebecca, it is the emotion, the fear of the subject that drives not only girls but also lots of boys away from the subject. First time into your blog, if you have succeeded in erasing some or all of the fear related to this beautiful subject from the minds of your students then you deserve more such honors.